Each year schoolchildren experience a unique adventure with O’Neill Sea Odyssey, a free, hands-on oceanography and ecology program offered aboard a sixty-five foot catamaran sailing the Monterey Bay. How did a decades-long battle against offshore oil drilling in California lead to this living classroom in the Monterey Bay National Marine Sanctuary? This book tells an inspring story of environmental heroism and imagination through two interconnected oral histories conducted by the UC Santa Cruz Library’s Regional History Project. Iconic wetsuit innovator and surfer Jack O’Neill and his daughter Bridget discuss their thriving program. And Dan Haifley, now the executive director of O’Neill Sea Odyssey, tells the story of how he and a team of environmental activists won a victory against Big Oil and spearheaded the creation of the Monterey Bay National Marine Sanctuary, protecting one of the world’s most diverse marine ecoystems. Includes complete audio of the oral history with Dan Haifley, which can be found under link to "Supporting Material." Link to the complete, archival oral history available online in the UCSC Library's Digital Collections. Link to a Youtube interview with Dan Haifley, Leon Panetta, and others, about the battle to establish the Monterey Bay National Marine Sanctuary. 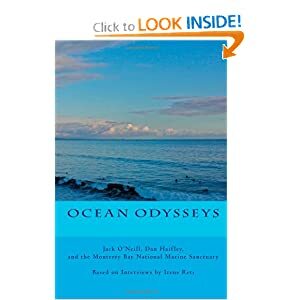 Link to an edited and illustrated trade paperback version of this oral history available from Amazon.com, O'Neill Sea Odyssey, or local booksellers.